It is a story about a 12 year old boy who moved to Seagrove Beach in 1993 on to a little dirt road called Campbell St. from a grassy suburb outside San Antonio, Texas. That little boy was me. My parents and I pulled up stakes and moved to the beach with a hardly a plan other than to enjoy life to it’s fullest on the sandy shores of South Walton. I was hardly a willing participant. I didn’t like the feel of the sand, nor the sting of the salt water in my eyes, or the blistering heat of the summer sun. But over time, I came to love it. I wandered all over the beach freely. I built sand castles, learned to fish from the water’s edge, and even learned to surf. The beach was a place to enjoy freely, with very little cares. I shared the beach with thousands of people over the years, without a second thought about who “owned the beach.” For the past 25 years, my beach access was at the end of the road across an easement between two condominiums. It is currently maintained by the county as a public access. On August 30, 2018, on my evening walk with my dog, I encountered a no trespassing sign immediately at the base of the stairs. The beach I have enjoyed for 25 years is no longer one my gulf front neighbors wish to share. The ironic thing about it is that the sandy shoreline in front of both buildings at the base of my access belonged to no one until 2015, when the condos obtained it through a process called “suing for quiet title” They paid no taxes on this property, and still do not today as the property appraiser says it has no value since it is unbuildable. They also paid nothing for the sandy portion of this beach but now want to exclude me and my neighbors from enjoying as we have freely for decades. For hundreds of yards in either direction the sandy portion of the beach is deemed “private”. As I walk my dog along the shores I grew up on, I am now a criminal. My 70 year old mother, who as I am writing this cannot stop crying, wished to spend her remaining years going to the beach she loves and taking an occasional swim, is also a criminal too. Florida Beaches for All, a 501(c)(4) not-for-profit, is hosting a critically important Customary Use educational event and presentation 5:30-7 PM, Thursday, August 23, 2018 at the O’Donnell Eye Institute (next door to the Donut Hole and across the street from the “SmallMart” Walmart in Santa Rosa Beach). The address is: 6757 U.S. Highway 98. We will meet in the conference room of the Emerald Coast Association of Realtors office on the 2nd floor. Our goal is to inform like-minded people of the complicated series of events that have led to the current threat to everyone’s right to enjoy free access to all Walton County beaches, as they have for generations. Walton County and Scenic Highway 30A are “ground zero” in this battle which promises to ripple across the entire State of Florida and all of Coastal America. At the event, you can show your support by completing an affidavit in support of the preservation and perpetuation of Customary Use. A notary will be present to make affidavits official at no charge to you. Florida Beaches for All will gather completed and notarized affidavits and deliver them to the appropriate officials on your behalf. Your attendance and participation are greatly needed. Please join us on Thursday! In Walton County, a convergence of tourists, a handful of fed-up and deep-pocketed beachfront homeowners, and “dirty politics” have created a tense scenario that could soon ripple across our state and all of coastal America. National media have already taken notice of HB 631 which, in layman’s terms, says non-beachfront property owners are only entitled to traverse or set up for a day at the beach in that sand seaward of the mean high-tide line, a 19-year average that’s about as clear as mud to the average Joe. Essentially, you can only walk or park in wet sand — which obviously leaves little to no room for fun. A record 116 million tourists visited Florida in 2017, followed by a record 33.2 million in the first quarter of 2018, a 7.4 percent year-over-year increase. According to the 2017 Walton County Tourist Development Commission’s Annual Report, four million of those tourists left behind $4.4 billion in Walton County alone, accounting for 73 percent of all retail sales and generating 65 percent of all local taxes. More than 22,000 jobs in Walton are tourism-based. Suffice to say, the county’s economy (like the entire state) is overwhelmingly fueled by tourism. BUT JULY 1, 2018 – WHEN HB 631 WENT INTO EFFECT — MAY GO DOWN IN HISTORY AS THE BEGINNING OF THE END FOR FLORIDA’S BEACHBOUND TOURISM. Beachfront homeowners argue their property rights are being infringed upon. "Customary Use" backers argue the beaches have been open for recreational activity for literally thousands of years. 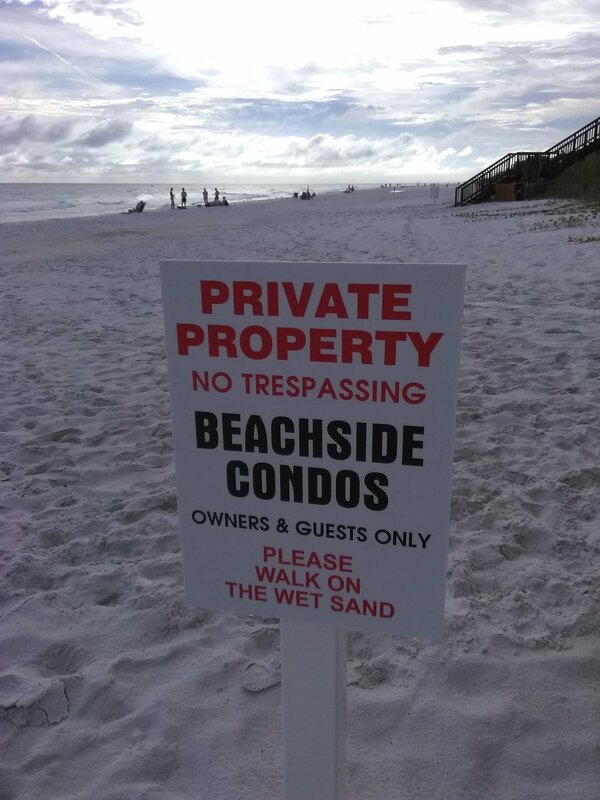 Just what constitutes a public and private beach is the question at hand. LAWSUITS ARE FLYING. “NO TRESPASSING” SIGNS MAR THE BEACH. SECURITY GUARDS PATROL WHERE PEOPLE ONCE FREELY ROAMED. TEMPERS ARE FLARING AND THE WALTON COUNTY SHERIFF FINDS HIMSELF IN A NO-WIN SITUATION WHEN TRYING TO ADDRESS CONFRONTATIONS ON THE 26 MILES OF WHITE SANDS THE AREA HAS LONG BEEN KNOWN FOR. Meanwhile word is getting out across America, and you can bet folks are considering alternative destinations for their next beach vacation. That goose and her golden egg? Yeah, she may have just left the building. It’s time to draw a line in the sand and say enough is enough. Repeal HB 631 and let Walton County — and all of Florida — continue to be one of the world’s pre-eminent tourist destinations. Copyright © 2019. All rights reserved Florida Beaches for All, Inc.